Enhance the look of your dining room with the Classic Oak Five-Piece Dining Set. It features four side chairs with arrow design backs and scooped seats for a charming touch. The chairs are supported by four slant legs. Plus, this dining set includes an oval-shaped table that can be extended with the help of the 18" leaf if you have additional guests. The table stands beautifully on a graceful pedestal base. Enhance your dining area with this country-style dining set. I do recommend this product. The only problem is that the chairs are a little too low for the table, which may not be a problem for taller people. The color of this set was exactly what we needed to match our existing oak cabinets, but I was taken aback by the quality of the product immediately after delivery. 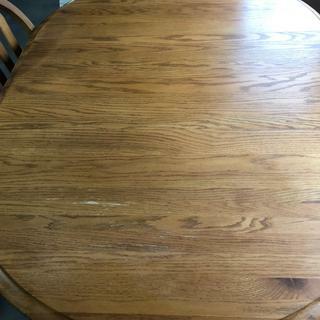 The bottoms of the chairs are roughly sawn off and the finish on the top of the table started to peel off within a week of receiving it (which makes no sense since we didn't buy a veneer table). If you get this table buy the coverage plan or IMMEDIATELY buy a glass top for it. 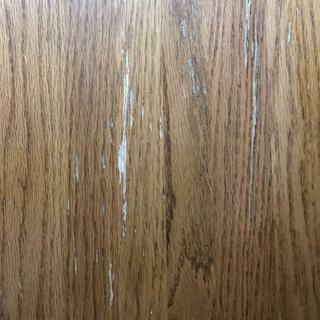 We've used vinyl placemats on the table since delivery to prevent damage and the wood continues to split. I am quite satisfied with the table and chairs. It is Good quality for the money, surprisingly!! This table is 30" high and is 42" x 42" round. It also comes with an 18" leaf which increases the size to 60" x 42".